At a distance in time, it is not easy to be as accurate in the recall of events as one would like. 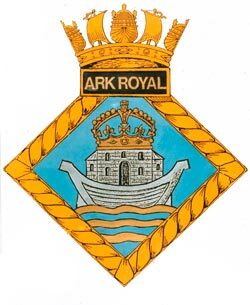 The real reasons why some twenty or so Cooks and Stewards, together with two Sub-Lieutenants from the aircraft carrier HMS Ark Royal spent a week as guests of 'A' Company, 1 Queens Surreys at their location at Robins Nest perched high on the Hong Kong/Chinese border, have been forgotten. But go they did, and the fact that the Supply Commander on the Ark was very keen on his staff taking part in "expeditions" probably had something to do with it. So too, no doubt did the close connection between the Royal Navy and the Regiment. The clincher however, was probably the fact that one of the Sub-Lieutenants concerned not only had a brother in the Regiment, but was also a friend of a Captain serving with the Battalion in Hong Kong at the time. Anyway after everything had been agreed, the intrepid matelots began their preparations on board ship. Kit was drawn, including jungle greens from the boarding party store and tents and rucksacks from the expedition store. Some items fitted, some would bring tears to a Sergeant Major's eyes (and did)! Rations were no problem. How could they be when half of the party were from the ship's Galley!? Fitness was not something that could be procured however, and it was not exactly a Commando group that was eventually assembled. Not surprisingly really, since all those involved hardly ever saw the daylight in their jobs and many were often required to work in conditions of great heat and discomfort deep in the bowels of the huge ship. But they did try. At least they walked around the bars of Wanchai beforehand! Everything ready, or almost at least, the "invasion" began. First there was a half hour sea trip, for the carrier was anchored off Green Island to the east of Hong Kong. Then everything and everyone had to be offloaded from the boat and put in the Army trucks waiting on the Kowloon side for the journey through the New Territories to the border. Being on land for more than an hour or two was also something of a new experience, since leaving Plymouth at the beginning of March and arriving in Hong Kong some two months later, the Ark had been at sea almost continually with only brief calls at Singapore and Olongapo in the Phillipines in between. Furthermore, the land where the sailors were heading was not "normal" land, it being seriously mountainous and rugged, which became ever more apparent as the journey went on and the border came closer. Indeed, as the trucks ground their laboured way up the mountain road to the dropping-off point, it also became obvious that there would be few luxuries and only the bare necessities. Water especially, would be at a premium. It was therefore, a somewhat chastened Naval group who eventually arrived at Robins Nest. But the welcome from Major Derek Bishop and CSM Les Wilson and all the members of 'A' Company (and the wonderful views from the top) more than made up for the apprehension. The soldiers quickly co-opted the sailors, a brew was put on and introductions made all round. Having pitched our tents it was then time for a briefing. We were told the Company was up on the border to assist in the apprehension of illegal immigrants crossing over from China, most of whom it seemed had been emptied out of the jails in an attempt to disrupt Hong Kong. The plan/method was to send out patrols and bring the Chinese to the company position first of all, and then take them down the mountain in trucks to a holding camp at a railhead at the bottom. From there they were returned to China. It sounded simple enough. The execution was proving somewhat harder however, and so the addition of the Ark personnel was much appreciated, even though their patrolling skills were few and far between and of necessity likely to be driven more by enthusiastic copies of cowboys and indians than textbook infantry tactics! Having been split up and allocated to the various sections it was not long before we were on our way. We soon found out for ourselves how hard was the terrain and how exposed to the searing heat of the sun were the mountainsides. It did not help that you might be able to see a Chinese across a valley. By the time you had clambered down and then back up through the thorny undergrowth, he had probably gone to ground in some inaccessible thicket and you had a tedious search on your hands. It was hot and tiring work and your water had to be carefully conserved. A sense of humour was very necessary and fortunately this was where Jolly Jack came into his own. No matter how much the limbs ached, how parched was the tongue or burnt the skin, there was always a joke ready - usually unprintable, but morale boosting certainly. Thus soldier and sailor worked well and thoroughly enjoyed each others company, never more so than when they had the chance for a welcome beer and rest by their tents after a patrol (and before the CSM chased us off again). For the sailors in particular, there was the reward of a job well done under the friendly guidance of new friends and perhaps more than anything, the uplift that a change of scenery and environment only can give. It certainly was different from working in the galley or wardroom of the Ark and what was more we did not have to do the cooking! So the routine went on for a week that went far too fast. Sadly and all too soon the time came to pack up our things and head back to the ship. But not before we had re-captured some of our victims at least once. For when we had taken them down to the camp at the bottom of Robins Nest where they had a big feed courtesy of HMG, after which the Police took them back to the border, it seemed the Chinese authorities merely let them try again. In particular there was a group of three gold smugglers who kept on turning up like Yo-yos. Not surprising really, after all they were skilled criminals! Farewells said, mementoes swopped, addresses and promises for "runs ashore" next time were exchanged, we hoisted our exhausted bodies onto the trucks for the journey back to Hong Kong preparatory to sailing off for exercises at sea with the US Navy off Okinawa and Japan. Not many remember that bumpy return road journey - they were fast asleep, a few dreaming no doubt of refreshing showers and a night in a bunk between fresh sheets. However, it had been a marvellous change and one laced with friendship and humour. Some were happy for it to have been their last and only experience of the life of a "soldier". But for one at least, it merely served to whet the taste buds. He transferred to the Royal Marines!